Barça remain league leaders following their dull victory at the Camp Nou over Malaga. After just two minutes, Barça took the lead when Deulofeu scored on Digne’s assist in front of the goal for his first goal of the season. Replays showed that the goal should have been disallowed because the ball went out of play before Digne set up Deulofeu. Malaga though showed why they were the bottom of the league standings by not threatening much and Iniesta doubled the Blaugrana’s in the 55th minute for the final goal of the match. This result means that Barça are still unbeaten in the league and league leaders. They will now shift their attention to the first leg of this year’s Copa del Rey competition away to Real Murcia. FC Barcelona: Ter Stegen; Sergi Roberto, Mascherano, Umtiti, Digne; Rakitic, Busquets (Paulinho, m. 75), Iniesta (c); Messi; Deulofeu (Semedo, m. 71) & Suárez (Paco Alcácer, m. 81). Málaga CF: Andrés Prieto; Rosales (c), Luis Hernández, Baysse, Juankar; Rolón (Cecchini, m. 67), Adrián; Keko Gontán, Peñaranda (Borja, m. 71), Chory; & Diego Rolán (Juanpi, m. 46). Goals: 1-0, Deulofeu (min. 2); 2-0, Iniesta (min. 55). Cautions: Luis Hernández (m. 21), Adrián (m. 39), Umtiti (m. 74). 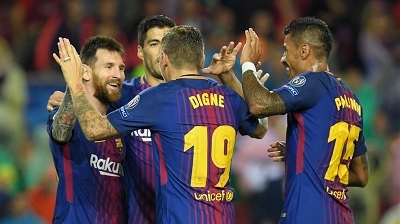 Previous PostBarça defeats Olympiakos 3-1 as Messi nets 100th European Goal. Next PostBarça defeat Real Murcia 3-0 in Cup clash.